Blenheim Palace – The annual celebration of Champagne is set to take over the country from 1st-7th October, and will be bigger than ever before, with 19 venues hosting more than 20 events across the country, each paired with a different Champagne house. 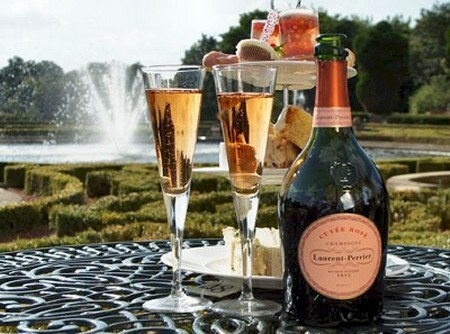 In partnership with the Laurent-Perrier Champagne House, Blenheim Palace will be celebrating National Champagne Week in style with a delectable Cuveé Rosé Afternoon Tea, available daily from 1st-11th October in our Indian Room and Champagne Bar, as well as a special opportunity to enjoy a Champagne Afternoon Tea in the Orangery. The special Champagne Afternoon Tea menu consists of red velvet cupcake, passion fruit drizzle cake, strawberry and Champagne jelly, raspberry éclair and cranberry & white chocolate scones, followed by a delicious selection of sandwiches, including Cajun salmon and chive, free range egg mayonnaise, pastrami and gherkin, cream cheese and cucumber smoked salmon blinis. All this is served with a glass of ice cold Laurent-Perrier Cuvée Rosé. Book now by calling our reservations line on 01993 810518 or using the buttons on the right-hand side of the page. If you are a first-time visitor to Blenheim Palace, your booking will include entry to the Palace, Park and Gardens. Dear Reader, please follow this link to obtain further information.. This entry was posted in Arts / LifeStyle / Travel and tagged Blenheim Palace, Champagne. Bookmark the permalink.